Gestures, and especially hand movements, are important because they help orchestrate the language comprehension centers of your brain. In fact, your brain needs to integrate both the sounds and body movements of the person who is speaking in order to accurately perceive what is meant. If your words and gestures are in-congruent, it will create confusion in the listener’s brain and you will be less believable. Our suggestion: practice speaking in front of a mirror, consciously using your hands to "describe" the words you are speaking. Use gestures sparingly. Your gestures should be natural. Avoid canned gestures. Your words should guide your gestures. Use gestures at key moments. Save your most expansive gestures for key moments in the speech. Reinforce your key messages with purposeful gestures...that work with your personality and style. The most effective gestures are spontaneous ones. They come from what you are thinking and feeling and they help the audience to relate to you and what you are telling them. It is much more effective to watch a speaker who uses movement than to listen to someone standing behind a lectern with hands clasped in front of him or clutching the podium. 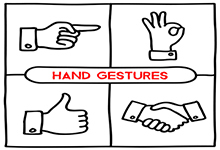 Your gestures should be varied; don't use the same motion over and over again. Repetition can be distracting to audience members and you may find they are watching your gestures instead of listening to the presentation. Some gestures interfere with the audience's ability to pay attention, such as the threatening ones like finger pointing and fist waving. To experience how much you rely on body movements to communicate, try telling a story without using gestures. You may have to plant your feet firmly on the floor and hold your hands behind your back. After talking for a few minutes, allow yourself to use body movements and notice the difference it makes. Note how you felt when you couldn't illustrate your points with your hands. How do you imagine your communication was affected? Ask your listener what differences he or she noticed. What are the gestures you use repeatedly? Are they threatening? Timid? Let’s look at more gestures and some of the negatives related to gestures. When giving presentations, men frequently stand in the "at ease" position commonly used in the military. They cross their hands behind their backs, and they keep them there. Or they cross their hands low in front of them like a fig leaf on a statue. Both men and women frequently cross their arms over their chests thinking they appear relaxed and confident. To many in the audience, this stance makes the speaker look merely defensive. By facing audience members with your arms crossed you are closing yourself to them, and they will sense this. Since your objective is to communicate with openness and sincerity, you want to make open gestures to reinforce what you are saying. Pamela Hart is the founder of Release Your Voice, a communications, presentation and public relations firm in Vancouver. Her internationally recognized programs address the public speaking challenges people endure. Trained in the art of public speaking, presentation and vocal training, she has 20 years experience on the stage and screen in New York and throughout North America. She has extensive experience planning and developing communications, public speaking strategies for public and private organizations in New York, the Balkans, Venezuela and Vancouver.